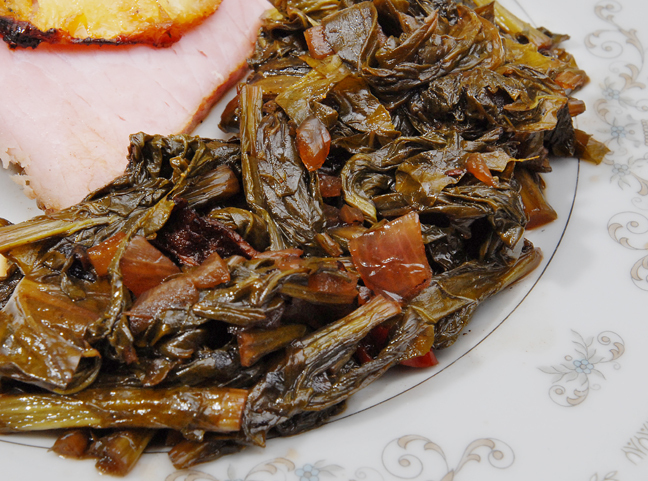 We have trouble finding a greens recipe that works for both of us, so when we saw one for collard greens over at AnnaShortcakes we just had to try it. Katherine often thinks greens are too bitter, unless they’re cooked in a fashion that eliminates any nutritional value, and I like them about anyway you serve them. We like this recipe because it used a bit of brown sugar and vinegar, which cuts the bitterness. The original recipe was part of a great Southern meal on AnnaShortcakes that included cheesy baked grits and chicken in pecan sauce. Also, check out her horseradish-crusted pork chops. Rinse greens and drain well. Cook bacon in a Dutch oven until crisp, remove and allow to drain on a plate lined with a paper towel Saute onion in the remaining bacon grease over medium until tender, about 5 minutes. Add broth, vinegar, brown sugar and peppers. Bring to a boil. Add the greens, stirring occasionally. Continue to boil until the greens are wilted. Crumble the bacon and throw that in the pot. Reduce heat to a simmer and continue cooking until tender, about 20 minutes. This entry was posted in Dinner, Food, Recipes, Sides and tagged greens, southern, vegetables. Bookmark the permalink. Ya know, I only found out this year that one *could* actually eat greens (I mean the “greens” from things like beetroot, turnips etc ofc)… I feel like I have a whole world of culinary exploration open to me these days, just from that! I had beetroot greens back in the summer with some chilli flakes and lemon juice… that was delicious. Adding in bacon and some sugar looks like it would really give them a nice bit of oomph! This looks like a gorgeous version of that beautiful elixir known as “a mess o’ greens”. Yes indeedy, I will be trying this one. Thanks! I’ve never had turnip greens before, Greg. I’m wondering if the texture is soft and mushy or does it still have a bit if a bite to it? Sweet and spicy is something I might enjoy. It still has some bite as long as you don’t cook them for hours. I love all greens. we almost always just steam them, but this looks like a great recipe to add a bit more flavor. Yum! So delicious.. and anything like this would be so good for you as well… bonus! Sounds good. I did a pretty similar thing with brussel sprouts, vendeen ham, garlic and Worcestershire sauce! Love the idea of both of us talking about ingredients that neither of us know! Turnip Greens? I’m with you, Greg, in that i can take my greens any way but this sounds great, as does that recipe for horse-radish crusted pork chops. Thanks for passing both along. Mmmm… you know greens make *me* happy! Greens and *bacon* makes me even happier… woohoo! Happy New Year, y’all and keep the good recipes (and delicious pictures!!) coming! I am so flattered that you featured my recipes! Thank you! I hope you and Katherine had a wonderful Christmas and have an even better New Year filled with delicious experiences. That was a great meal! You’re quite welcome. Hope you had a great Christmas too. A few years ago my Mom and I experimented with lots of greens and discovered that the best ones always involved bacon and lots of vinegar! Looks like you know what you’re doing! I love that you added crushed red pepper for a little heat! Thanks! We keep hearing vinegar is crucial to cut the bitterness. Hope you’re having a great holiday season. I love every kind of green. I always serve the greens with tabasco vinegar. In Texas, it was always served when ordering greens as a side dish. I agree that greens can be bitter – but with the right seasonings good cooking technique, the bitter can be made much more mild. The balsamic/brown sugar/chili combination sounds intriguing; I’ll have to try this one. This recipe is right up my food alley so to speak! I love greens cooked like you have done and I also add red peppers for a bit of heat. Tasty! I’m with Katherine on not wanting bitterness, but then I do not like any greens or veggies overcooked. So I’m quite interested in this recipe. Not being a Southern gal, I don’t have much experience with greens…except those dandelions my dad use to pick!! I recently read somewhere that turnip greens were edible! Ha, I have so much to learn. I love turnips, so I’m guessing I will love the greens, too! These greens look delicious. Though, as a Southerner, I have to admit that I prefer my greens with some bacon in them. Love the addition of bacon. Greens is what I Crave this time of year. With all the rich and sugary foods, a good heaping helping of greens with its bit of “bitter” tastes delicious to us! Turnip greens aren’t as easily found where we live, but I’d love to try them so will look a bit harder. The original recipe called for collard greens, not sure if those are any easier to find for you. I tend to side with Katherine when it comes to greens. I may have to give this a try if she gave it a seal of approval. And for the record…the brie…AMAZING! I’m not a fussy green’s eater, but think this will be a bit of a favoured recipe. I love pretty much all vegetables and think would be a perfect way of cooking a Savoy cabbage I have in the fridge. Should have been for Christmas Day with bacon and chestnuts but we forgot….too much celebrating was going on! I am going to try this. Of course, I love turnip greens just about any way you fix them. I have never had turnip greens. I must test your recipe! As soon as I saw bacon I knew it must taste great! Like you I love greens in any state, but crisp and vibrant would be the way if I had a choice.